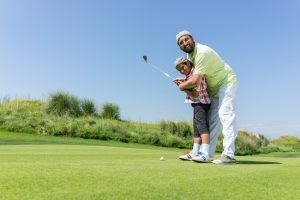 Your little golfer deserves the very best; from clubs to gloves, you want to make sure that when they walk onto the green, they are as prepared as they can be. When you are outfitting them head to toe, make sure they are stepping onto the course in the very best golf shoes to improve their game and confidence. Kids golf shoe needs are a bit different than adults, just as their golf game is different. When you are shopping around for a new pair of kids golf shoes for your future Arnold Palmer, it’s easy to get overwhelmed by all the choices available. So we’ll simplify the process. Here are the top ten kids golf shoes available today. Before you start adding things to your Amazon cart, let’s make sure you know how to choose the right shoe. Golf shoes are slightly different from your typical sneaker. They are meant to fit snugly and provide traction as you walk the course. Your child may wear a slightly different size in golf shoes than they do in regular shoes, so keep that in mind when shopping. It may be helpful to take them into a golf store and have their feet measured to ensure the proper fit. You’ll also want to consider style. Typically children don’t need a dressy style golf shoe. Rather, you will probably want to look at a style similar to regular sports shoes or even a golf sandal. Once you’ve determined what type of shoe you are after, take a look at the price point. Golf shoes range in price from as low as $25 on up the hundreds. Your budget and your child’s level of play will help determine what you are willing to spend on a shoe. DAWGS makes a lightweight, comfortable golf shoe. The design is similar to that of clog-style shoes you’ve seen all the kids wearing. These are ideal shoes for beginning golfers, as they feature a hook-and-loop fastener and are designed to be more similar to something your child may already be used to wearing. These shoes are also incredibly affordable as compared to other kids golf shoes. They run between $15 and $20, making them an ideal beginners shoe. The description for this shoe boasts a “Directly welded energy sling to guide energy transfer and prevent power leaks”. With content writing like that it’s got to be good. This choice is on the higher end in terms of price point, but you definitely get what you pay for here. Adidas knows what they are doing in terms of golf shoes. The soles are cushioned with memory foam and the outer layers are waterproof to keep feet dry on the course. These say “Boys”, but FootJoy makes a golf shoe for girls in this same style. This shoe uses the same cleats as many professional shoes, which makes them high-performing in terms of traction. This kind of cleat is also highly durable and easy to clean, a must for kids golf shoes. This is another Adidas offering, this time in a less formal option. This is branded as a skate shoe but sold as a gold shoe. The cleat pattern is lighter weight here. The Adicross opts for a lug system on the sole rather than spiked cleats. This system works, though, providing heavy-duty traction in a lighter weight shoe. This kind of system is ideal for kids golf shoes, making them easy to clean and comfortable, closer to something your child is already used to wearing. Th only sandal to make the list, FootJoy here has produced a more casual option. Sandals are a good secondary option for a child who is used to being on the course, especially in warmer weather. FootJoy knows its golf shoes, and this sandal is proof. The traction system is built into the outsole, and the hook and loop fasteners help players achieve a snug fit, even in a pair of sandals. If you are in need of a more flexible choice in kids golf shoes, FootJoy has you covered. The material here is breathable and allows for free movement. Like the Freestyle, the Hyperflex utilizes highly durable, easy to clean spikes, similar to what you would find on professional golf shoes. The one caveat here is that these shoes do tend to run large, so it might be helpful to order a size smaller than you normally would. Nike here has produced a golf shoe with integrated traction. It’s a bit of both in terms of spikes vs lugs and is fully integrated into the outsole of the shoe. The outer synthetic leather is water-resistant, making it ideal for morning rounds when the green isn’t quite dry. This Nike golf shoe differs from the Nike Control in one key way: traction. The VT opts for a true lug system that helps the shoe transition nicely for both golf and regular kids playtime. This shoe is great for a child just getting into golf, or for someone who plays more casually and needs a shoe that will go back and forth between the course and the playground. PUMA has created here one of the highest selling kids golf shoes, so it can sometimes be difficult to find in stock. If you can get ahold of it, however, it is a great option for your little golfer. This is another shoe with fully integrated lug traction, in a design unique to PUMA. The shoe also features foam insoles for maximum comfort. The Titantour is PUMA’s cleated option, giving you a more traditional traction system if you prefer it to an integrated one. Just like the Biofusion, the Titantour is designed with foam insoles and features a 1-year waterproofing guarantee to keep your feet dry on the course. There are myriad options when it comes to kids golf shoes, and it’s hard to go wrong. No matter what your play level, traction preference, or price point, there is a golf shoe for your young Arnold Palmer. What golf shoe do you put your kids in? Let us know below!